Heat oven to 200C / Gas Mark 5. Cut a slit in the side of each chicken breast and use your finger to make a pocket. Mix the mozzarella, lemon zest, the parmesan, capers and chilli flakes in a bowl. Place the mixture into the pocket of each chicken fillet and secure each with a cocktail stick. Put oil at the bottom of an oven proof dish. 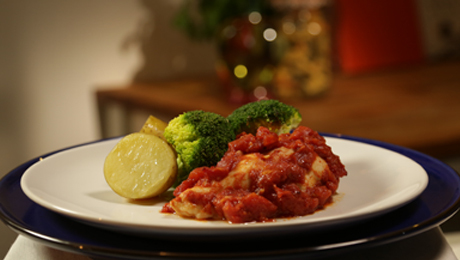 Place the chicken in and sprinkle garlic and pour in the canned tomatoes.. Bake for 15 - 20 minutes until cooked through. Meanwhile, heat the remaining oil in a pot over medium heat and add the garlic and cook for 1- 2mins, be careful not to burn. Add the tomatoes and simmer for 10 minutes more until it has become slightly thicker. In a pot of boiling water, place the potatoes and simmer until cooked. Spoon the tomato mixture on a plate and top with chicken. Serve with potatoes and steamed broccoli.